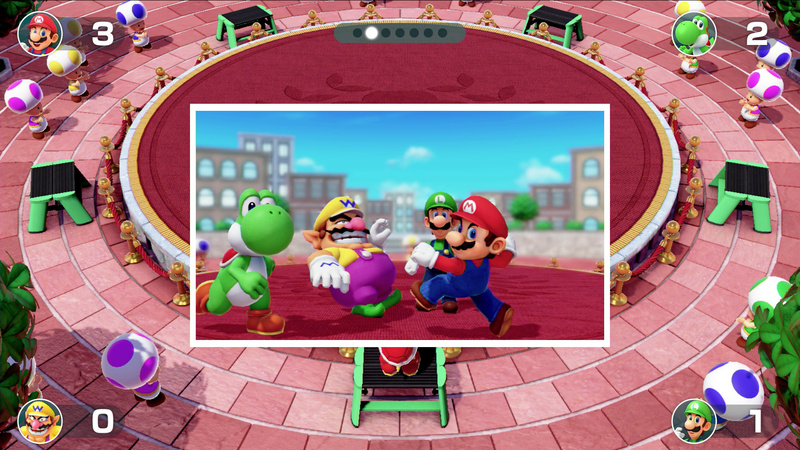 Feature: What's New In Super Mario Party? There's loads of stuff in Super Mario Party. In fact, there's arguably more variety than any previous Mario Party game. But what's old? What's new? What's the banana game? 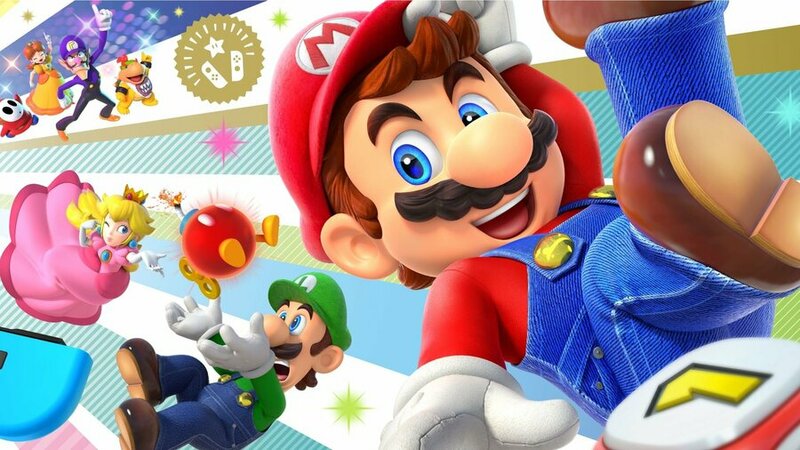 Well, in this feature we're going to take you through the lion's share of what's new and improved in the latest game in the Mario Party series. 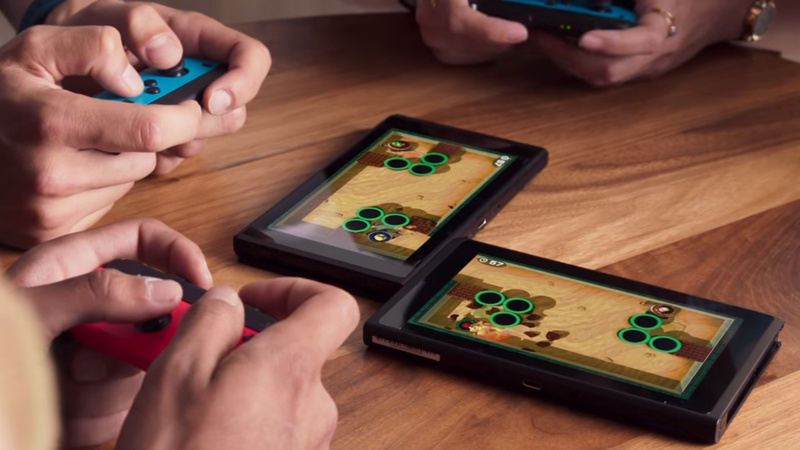 It may be the return to the old formula that many have been begging for, but the old-fashioned Mario Party isn't the only game mode you'll have available at your fingertips, oh no. 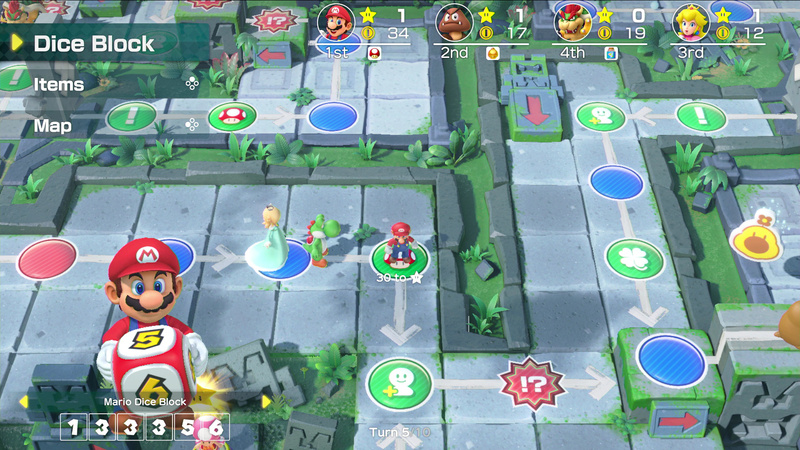 Partner Party is an evolution of the gameplay that first appeared in Mario Party: Star Rush; you move around a grid board freely rather than a set path with a few forks, but this time you'll be doing it with a partner, as the name suggests. That means you'll be involved in a 2v2 party rather than being a total free-for-all, allowing for some interesting strategies to be employed, by which we mean new and exciting ways to shatter your friendships. At least one of them will be maintained. River Survival is a four-player co-op experience that tasks you with careering down a raging river whilst paddling in sync, slamming into minigame balloons, and avoiding more river-themed obstacles than you can shake an oar at. You're on a time limit to get to the end, but as long as you work together, you'll do brilliantly. Sound Stage is a minigame rush mode that employs nothing but rhythm and timing. Charge through them to the sound of some classic Mario tunes and see who can score the highest and be potentially crowned the next Mozart. And finally, if you're more on a solo mission, you can indulge in Challenge Road. This will take you through every one of the 80 minigames on offer with occasionally mixed-up completion requirements. If you breeze through it all too quickly for your liking, return to the start and try and beat the harder challenges that you've just unknowingly unlocked. When the party's just a bit too much, you can always retire to Toad's Rec Room for a bit of an old 'chillax'. Here you can play a variety of minigames that aren't really suited to standard board game play, be it due to length, complexity, or requiring more than one Switch console. Three of the four games only need a single system, but one of them requires two to even function. You have to rotate your consoles around to match up two halves of a banana perfectly, swipe across both screens, and yes it's as ludicrous as it sounds. Break it out at Christmas if you don't want to get into a whole, hour-minimum session. What's better than having a myriad of playable characters to choose from? 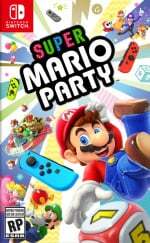 Super Mario Party offers more characters than any previous game in the series, with 16 being available the moment you slap your Switch on, and an extra 4 to be unlocked as you progress. That makes a total of 20 for any of you maths fans out there. Each character also has their own unique die that they can roll. This was also present in Mario Party: Star Rush, but it's been streamlined here to be more universal and less context-sensitive. These special dice can have a face value of up to ten, but can also cause you to gain or lose coins if you're lucky and/or unlucky. Even if your character's die looks rubbish, you never know when it might be beneficial to roll a lower number than usual, or even just stay where you are, especially if you're on an Item Space. 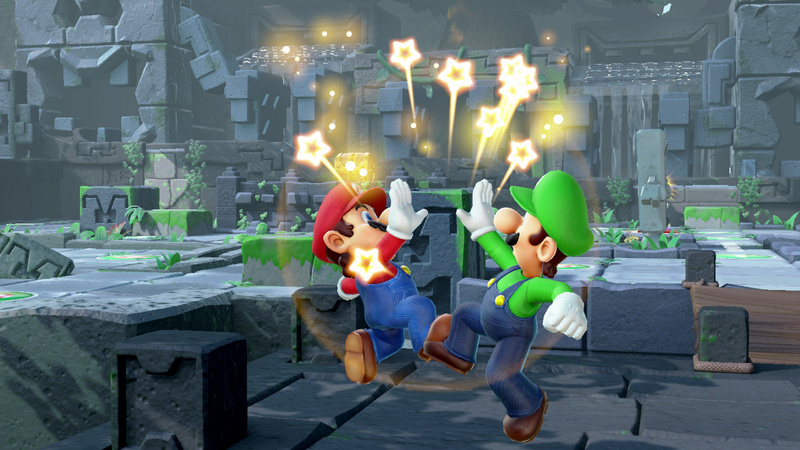 Not only that, but characters that aren't in the party can be called upon by landing on an Ally Space, using the Ally Phone item (known as Buddy Phone outside the UK for some reason), or in the case of Partner Party, just running into them as they stand waiting patiently to have something to do. Every Ally Character you have in your entourage can add up to 2 to your roll each, and you'll also be able to use their special die if you so choose, so try and nab as many of these characters as you can! If you're looking to take things onto the internet and only destroy long-distance friendships, Super Mario Party has online for the first time in the series. Sadly this doesn't include the main board game modes, but rather a short burst of minigames. The 10 minigames available are divided into cups which rotate as time goes by, and can be played with friends or randomly selected strangers. You also unlock stickers as you go through the game, which you can arrange on a series of backgrounds and share with the world by taking a screenshot. It's a simple addition, but that's your thing, enjoy! What's your favourite new feature in Super Mario Party? Let us know by leaving a comment below. The biggest new thing in Super Mario Party: it's actually a good game. My "bizarro-AlexSora89" primarily-Xbox-loving friend, converted by the Switch (well, sort of - Microsoft remains his primary entertainment family, but he has warmed up a lot to Nintendo as of late) and by the sheer quality of the console, has had a surprising lot of kind words for his first major, full-price launch day purchase of a Mario Party game. Considering his tastes are usually very demanding, it's kind of a strong statement. While my first game was a bit of a disappointment, playing more and more quickly showed me that I was simply dealt a poor hand initially. 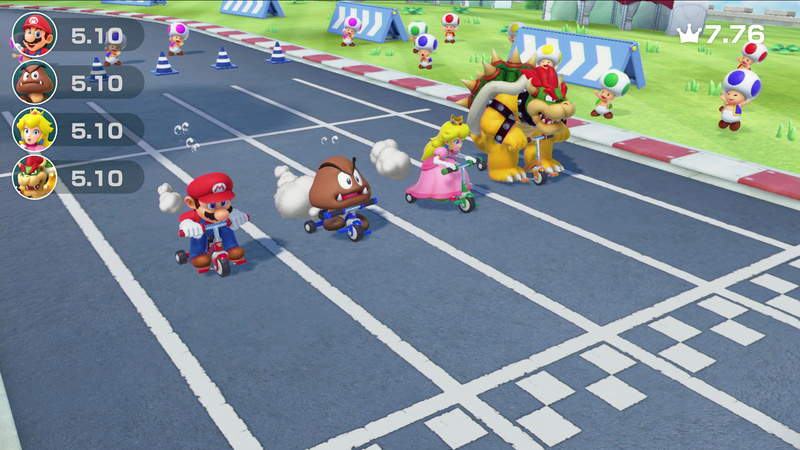 While I do agree that the game needs more content for each of its modes (or just more boards/mini-games for the main mode), I have to say that this game really takes me back to what I have always loved about Mario Party. The majority of the games are great, two of the four boards I find to be incredibly well designed (with one board still feeling standard, and another quite "meh") and the sheer amount of variety in terms of how to play is great. Definitely shows off how the single joy-con can be used to great effect. I finished off all of the main content on my own and still had quite a fun (if not sometimes repetitive) time. Looking forward to having a party with friends! I was gonna get this day one, but I don't like the fact that I can't play it on portable mode! The best feature about this game is how it slowly removed itself from my purchase list with stuff i found to be counter productive to fun. Saved me £60... That's no easy feat. The last Mario Party I bought had a wonderful Monopoly'esque board, where you bought squares or something...? Memmeryfale. I'm quite disappointed that this doesn't include one of those, as it was the one board that I really enjoyed. @Jayenkai sounds like the map from Mario Party 8 on Wii where you would invest in hotels and whomever invested the most coins owned that particular hotel and its star rating. One of my favorites from that game, though the dolphin boardwalk with pirate goombas or the shyguy train that rearranges itself were also great. I really like Super Mario Party. Best game in the series since some of the earliest entries. We love to play it at my house. The biggest disappointment is the lackluster online part of the game. It would be fantastic if you could play the full Mario Party experience online. But that's the only real negative ting I can say about the game. The New Partner mode is also so fun. @Illusion Possibly that, yeah. I haven't bought many Mario Party's.. .. You'd think I could remember! I guess my lack of overall interest in the franchise is likely the reason why I keep forgetting how mind-numbingly dull and drawn out it can be, playing through the game with only CPU opponents. we should have an option or two for a six or even an eight player Partner Party. just add more maps with DLC in the future, but for now it's a phenomenal party game. My house is loving this at the moment. Playing the 4 player co-op puzzles is a blast, and something for all ages. @ilikeike Yup, it's nice to finally be saying that again. There are still a lot of issues with the game: only four boards, 20 turn limit aside from the Kamek board, and the ally spaces being really overpowered. Some of the alternative modes, like Sound Stage and River Survival feel a bit underdeveloped as well. But it's the first time since Mario Party 8 since I've had fun playing a Mario Party game with my friends. Mario Party and Partner party are blasts and most of the mini-games are great. Fingers crossed for a few free DLC boards! The only problem with this game is forced Joy-Cons.They are so small and uncomfortable, I don't know why we can't optionally use the Pro Controller. It does everything the Joy Cons can do: HD rumble, gyroscope and accelerometer. Even for the mini-games that required a "waggle" to throw, just let us press "A", if not than we can waggle the damn Pro Controller. @JAPBOO From what I can tell the minigames are all available from the start, they're just not listed at the start. When you play some minigames are marked "??????" and only appear as named after you play them once. The more difficult versions of minigames in the singleplayer portion are locked until you complete the minigame once, but for multiplayer everything seems to be there from the start, aside from some characters. They probably should have spent more time on the actual main game than all this side content that's fun for maybe 5 minutes. Oh well maybe next Mario Party. @Krazzar all right, thank you, great to hear this!! Only 3 things are keeping it from being a perfect Mario Party game. "But what about people who rage quit?" You could have them turn into an AI. You could rejoin the said game within 5 minutes of being disconnected. Could also ban people for a few minutes for disconnecting frequently. -Cannot toggle on and off allies. Gives people an unfair advantage. I lost so many times because of people having ally dice helping them out. Should keep keep it in the partner mode of the game to be honest. Technically only 3 maps from the start of the game and the final one being unlocked after a short while of playing. Compared to the other Mario Party games these maps are very small and soulless. Hopefully some free DLC comes out in the near future like Splatoon 2 and Mario Tennis Aces. I'd give this game a 7.5 for single player and an 8 if you have friends to play with. My favorite new feature is River Survival, but it's the only mode in the game I actually enjoyed. Everything else felt attached to a major flaw that breaks the deal for me, such as harder opportunities to get allies in Mario Party, invisible Bad Luck spaces in Partner Party, Sound Stage that ends off too abruptly due to the little levels it provided, Toad's Rec Room that's too short in content (heck, pretty much everything in this game feels too short in content), and Challenge Road that's basically tedious and repetitive. The mini games also felt too soft and lacked any charm or inspiration compared to the previous ones (including 9 and 10). Overall, I don't hate this game, but it's not doing anything to wow me right now. Hopefully some updates in the vein of Splatoon/ARMS/Super Bomberman R/Kirby Star Allies/Mario Tennis Aces will help because that's the only thing that can save Super Mario Party right now. "In fact, there's arguably more variety than any previous Mario Party game." Star Rush holds that title for me in both quality and quantity.